Ew’d Withers, Bookseller At The Seven Stars Over Ag’st Chancery Lane Fleet Street, Sells Variety Of Books In All Facultys & Sciences, &c.
This decorative trade card, with various typefaces within decorative scrollwork borders with finials, putto’s head, and seven stars motif, was created for London bookseller Edward Withers, who had his business at this address from 1732-1757 (Plomer, Dictionary of Booksellers). Withers died in January 1759. • Swearing, a Satire; With a preface to the swearer; Some verses on the late judgments of God, and on the death of His Royal Highness Frederick Prince of Wales By John Taperell, (b. 1710). London: printed for E. Withers 1751. • The Timber-Tree Improved: or, the best practical methods of improving different lands with proper timber By William Ellis (ca. 1700-1758). London: printed for the author, and sold by J. and J. Fox in Westminster-Hall; and at their shop at Tunbridge-Wells, during the summer season; sold also by E. Withers, and T. Cooper 1738. • An Alarm to a Careless World: A discourse occasioned by the late earthquakes, preached November 30, 1755, at St. Dunstan's in the west by William Romaine (1714-1795). London: printed for J. Worrall; E. Withers; and R. Withy and J. Ryall 1755. The tenth edition. • The Case of the Jews Considered, with regard to trade, commerce, manufacturies and religon [sic], &c by Andrew Henderson, Andrew( fl. 1734-1775). London: printed for R. Richards; W. Reeves and E. Withers; J. James and E. Cooke 1753. 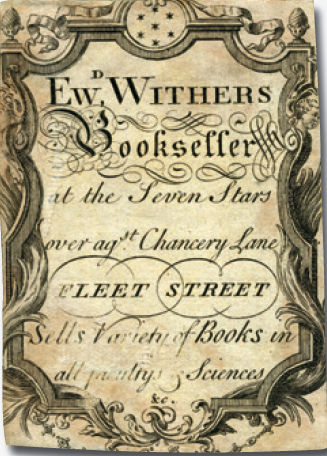 Ew’d Withers, Bookseller At The Seven Stars Over Ag’st Chancery Lane Fleet Street, Sells Variety Of Books In All Facultys & Sciences, &c. [London]: [s.i], [c1737-1757]. Single sheet, 95 x 70mm, mounted on heavy gray paper 200 x 125mm. Image courtesy of Alastor Rare Books, with our thanks.